From time to time in our trek we will take a side trip, when something interesting presents itself, or when the river itself is just too damn dreary. I think Lee is a bit more dedicated to actually following the river along the river than I am. Myself, I’d just as soon parallel its course here and there, and not always because there’s no alternative. I’d rather have an interesting walk than just a river walk. But it usually works out okay. 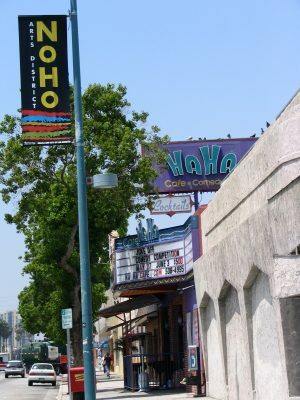 We had seen signs on lampposts for the NOHO Arts District. What was that all about? Were they saying that painting or performing prostitutes were forbidden there? Was it like the “Drug-Free Zones” you see here and there? I thought all of America was a drug-free zone, seeing as drugs are illegal. Are prescription drugs banned in drug-free zones? Many of them are schools, and believe me, if you banned Ritalin there you could expect carnage. As for no hos, who cares if a ho wants to make a painting or do a tap dance? I’d expect you’d be more concerned with her hustling than with … what’s that, Jane? You say it has nothing to do with hos? It stands for NOrth HOllywood …? Well, that’s very different, then. Never mind. We decided to save a few bob—sorry, I’m reading P.G. Wodehouse—in gasoline (currently about $3.55 per gallon in LA) by taking the train to the end of the line, which happens to be North Hollywood, then walking back to the Universal City Station. It seemed a good plan, until the train pulled out of the Universal station and sped … and sped and sped and sped, through the tube … my god, how long is it between these two stations? It didn’t look that far on the map. Turns out it’s about two miles. Oh, well, nothing for it but to stick to the plan. North Hollywood Station is quite nice, with large circular tile murals depicting the momentous events that have happened in North Hollywood … which would seem to have been few and far between. One featured Amelia Earhart, and I have no idea what she had to do with North Hollywood, though the plane for her fatal journey seems to have been built in Burbank. But the star of the show was Nudie, the rodeo tailor! You may never have heard of him, but he was quite the character in the 1950s and even beyond. He and his wife invented those rhinestone suits all the C&W singers used to wear. (And some of them still do, I guess.) 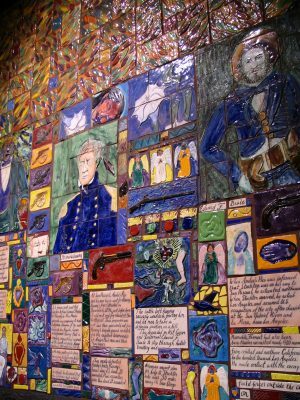 He also customized Cadillacs with horns on the front, cowhide seats, and pistols for door handles. Bad taste so awful it was wonderful. Back in the time I lived briefly in Los Angeles, mostly on the streets, more or less, I don’t think anyone had anything good to say about North Hollywood except the rents were cheap. One look at the apartment buildings told you why. You had your choice between shoddy and shabby, mostly. It seemed presumptuous to even attach the name Hollywood to the area, as it was separated from the real Hollywood by nothing less than the Cahuenga Pass. The luxurious wall of the Santa Monica Mountains cut NoHo off from the real phony glitter to the south, and even the Valley movie studios were all to the east, in Burbank. But it’s changed. It seems to have been a deliberate thing, creating the NoHo Arts District. 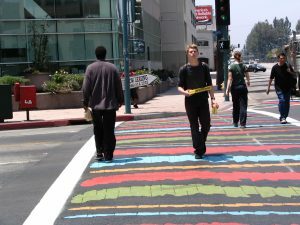 The crosswalks all look as if they had bright paint spilled on them, but then you see it’s colored bricks, and the theme is repeated on the banners that adorn every streetlight. The scene seems to be centered on the intersection of Lankershim and Magnolia. We set off down Lankershim to discover it all. The very first thing of interest we encountered was a giant, golden Emmy. This turned out to be the headquarters of the Academy of Television Arts and Sciences. I have to say it’s a mighty impressive place. 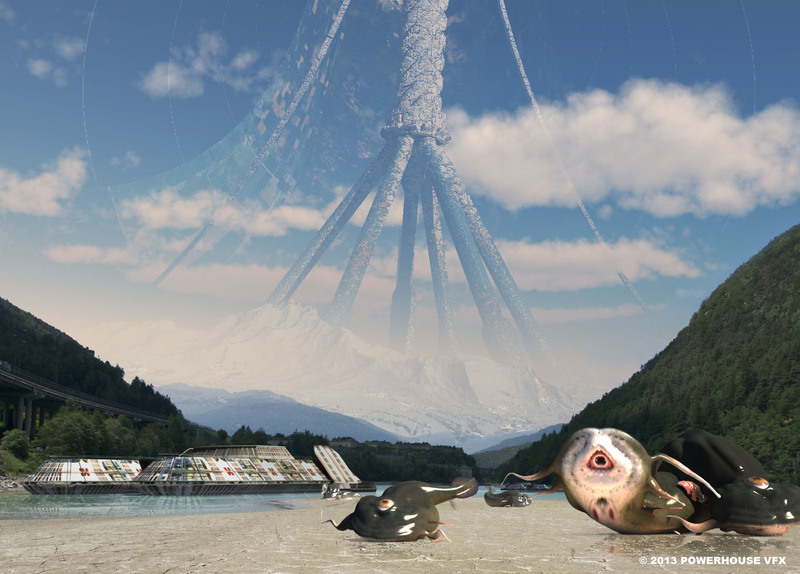 Tourists would love it … but there’s not a tourist in sight. They’re all down south, in the real Hollywood, having their pictures taken squatting on somebody’s star on the cheesy, dirty streets in front of the Kodak and Grauman’s. We have the place to ourselves. I doubt that any tour buses ever get out here; it seems to be a strictly Los Angeles place. Fine with us. We don’t like crowds much. Instead of names and stars embedded in the filthy street, the ATAS has opted for three dimensions. There are busts of great television personalities, and a wall of friezes of some of the most noted, including Walter Cronkite, Jim Henson and the Muppets, and Steve Allen. 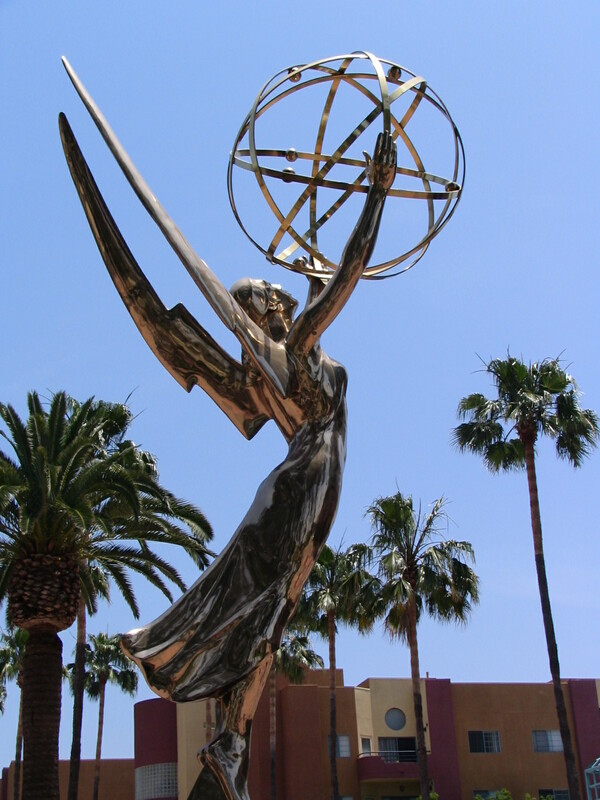 There are three life-size statues: Johnny Carson, Jack Benny, and one that isn’t labeled but has to be Judy Garland. … Judy Garland? What did she have to do with television? Maybe we were mistaken, but it sure looks like Judy. There is also an “And away we go!” statue of Jackie Gleason, that really should have been life-size. We paused for Greek or Armenian—middle eastern, anyway—food at the Noosh Deli. Beef kabob for me and stuffed grape leaves for Lee. The beef was rather tough. Then on down Lankershim. I think there are more little theaters, acting workshops, dance troupes and schools, and talent agencies in the next six or seven blocks than there are taco stands in East LA. There are some trendy restaurants and sushi bars, too. It’s all very impressive, but in the end what I was struck by was that when all is said and done … it’s still the goddam Valley. It’s not nice to be prejudiced, I guess, but I can’t help it. The San Fernando Valley is mostly the pits. You can splash paint on it and give it a trendy veneer, and it’s still a square grid of streets stretching to infinity on the east, north, and west, and walled off from the real LA by the mountains to the south. Every mile east to west there is a main boulevard: Magnolia, Burbank, Oxnard, Victory, Vanowen, Sherman, Saticoy. Every mile north to south there is a main boulevard: Sepulveda, Van Nuys, Woodman, Coldwater Canyon, Laurel Canyon … neither of them really canyons out here in the graveyard of what used to be endless orange groves during the first part of last century. The airport is named after Bob Hope. Of course there are some nice places, and we’ve been through most of them by now: Toluca Lake, Burbank, Studio City, Sherman Oaks. 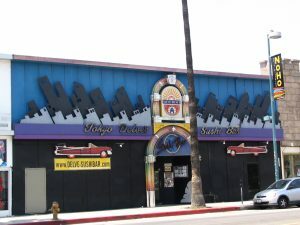 But by the time you get to Pacoima and Northridge, it’s Abandon All Culture, Ye That Enter Here! The only real culture the Valley has ever had is the car culture. Nudie, Big Daddy Roth, the Barris Brothers, Kustom Kulture, hot rods, drag races, lowriders. All interesting and amusing, but still … it’s the Valley, dude! 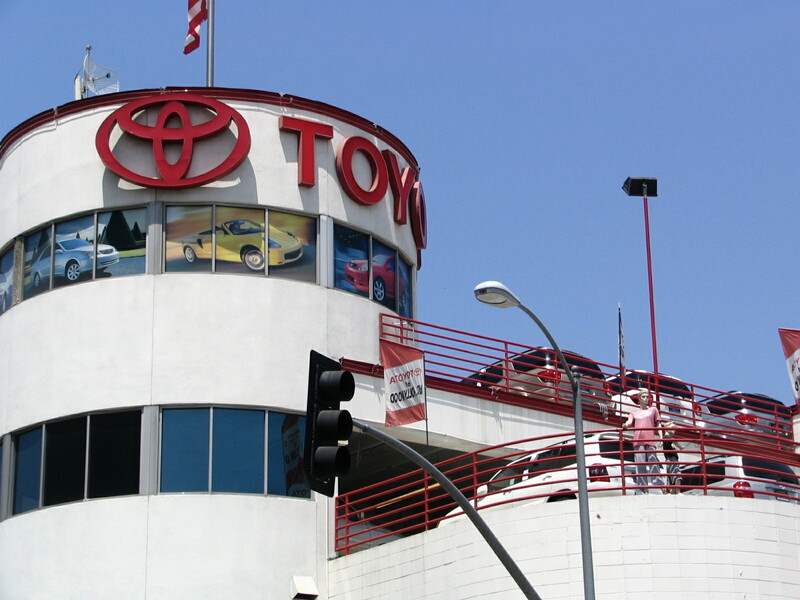 And sure enough, soon the Arts District gave way to some of the biggest car dealerships in Los Angeles. Huge three and four story structures packed to the gills with SUVs and luxury cars. Across the street was a place that dealt only in mini-Coopers, those new ones made by BMW, cute as bugs. And they come in colors, too. It looked like a lot strewn with Easter eggs. On our side of the street was the real BMW dealership, and it looked like you could have a BMW in any color you wanted as long as it was black or dark gray. Okay, a few white ones. 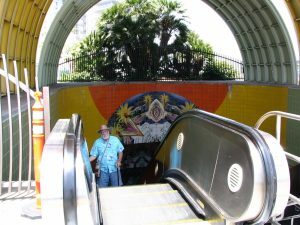 Eventually we found our way back to the Universal City subway station, after first passing the Campo de Cahuenga, one of the original adobes built shortly after the arrival of the Spanish. There’s nothing left of it but the foundation, and the street covers part of that. I think they dug it up recently and were surprised at what they found, but I’m not sure, as the whole thing was surrounded by a fence, closed, locked up tight. And frankly, I was too tired by then to read the sign. Universal City Station is another good one. 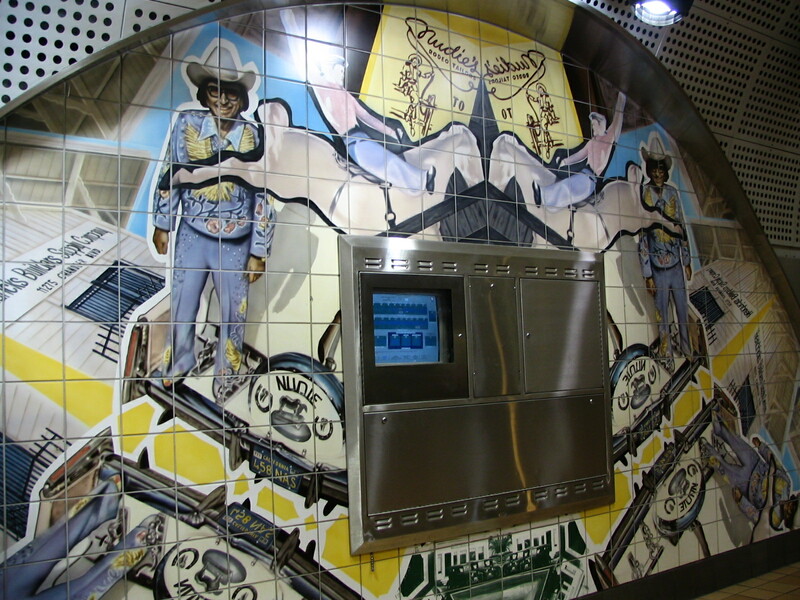 The pillars are decorated with tiles illustrating the history of Los Angeles, and they come in pairs. On one side of the pillar is scenes with English text, and on the other side identical scenes in Spanish.